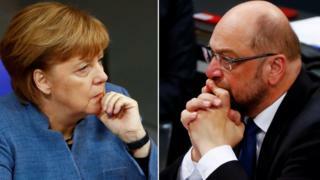 The advance paves the way for formal coalition talks between Chancellor Angela Merkel’s Christian Democrats (CDU) and their former coalition partners, the Social Democrats (SPD). The talks focused on differences over tax and migration, German media say. The CDU and its Bavarian CSU ally have been unable to form a government since inconclusive elections in September. It is Germany’s longest ever post-war period of coalition-building.